Several years ago, two families of Guardian Angels Care Center made generous donations to enhance the Reflection Room – a designated place for all residents, residents’ families, and Guardian Angels’ staff – to use as a quiet place for prayer and meditation. It’s available all hours of the day and all are welcome to visit. George and Joan Zabee donated a stunning stained-glass window in memory of Joseph and Frances Zabee and Thomas Zabee. The Wilson family donated a beautiful altar in memory of Roland and Edith Wilson. The stained-glass window and altar added such beauty to the room and Guardian Angels will be forever grateful to the Zabee and Wilson families for their donations. As time passed, we found our Reflection Room in need of renovations. With the assistance and sponsorship of the Friends of Guardian Angels, led by Chair Donita Grell and a group of auxiliary volunteers, the project began. After many updates our Reflection Room is once again a welcoming space for all who seek a quiet place to spend time with family or private meditation. 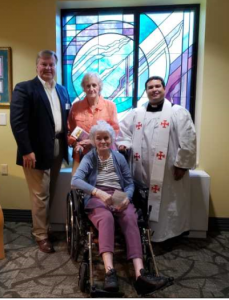 This summer the Care Center hosted a consecration for the Reflection Room and Chapel where Guardian Angels’ Chaplain Joe Calandra resided over the blessing. Thank you to all the Friends of Guardian Angels’ members for making these renovations possible. Your continued hard work and fundraising efforts allowed for this beautiful renovation and new items for the Chapel. We are sincerely grateful for your many years of volunteer efforts and commitment.